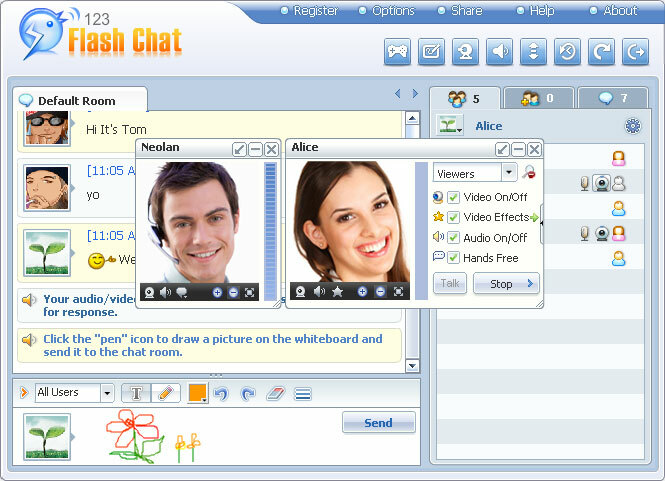 123 Flash Chat Softwarex32bit is the leading chat server software for websites like dating sites or social network services, with video chat and text chat. It can be added to almost all CMSes: Joomla, phpBB, vBulletin, Skadate, etc. and enable single sign-on. It has literally every feature you will need in a chat, and it works well cross-platform. Meanwhile, the level of the administrative options makes things easy for website owners. ...... , phpBB, vBulletin, etc., and enable single sign-on. Chat users may introduce the chat room to their friends on Windows Live Messenger, gtalk, Yahoo Messenger or Twitter, so your chat may be spread mouth by mouth in social networking sites. 123FlashChat has various chat clients: Flash client, HTML/Ajax client, avatar chat, pocket PC cilent, lite chat, iPhone client, iPad client, etc., which makes it possible to be accessed from most o f the devices, whether on PC or via mobile phone. Full-featured chat server for powerful Joomla: live, easy and affordable. Qweas is providing links to 123 Flash Chat Softwarex32bit 9.1 as a courtesy, and makes no representations regarding 123 Flash Chat Softwarex32bit or any other applications or any information related thereto. Any questions, complaints or claims regarding this application 123 Flash Chat Softwarex32bit 9.1 must be directed to the appropriate software vendor. You may click the publisher link of 123 Flash Chat Softwarex32bit on the top of this page to get more details about the vendor.